There's no running water, no plumbing, no electrical outlets. The environment is so forbidding in this vast and dusty desert that there aren't even insects. So it's not the kind of place to expect full bars on your smartphone. Of course, that's a big part of the charm. The only thing not lacking in Black Rock City, Nev. ? the temporary city erected each year as the home of Burning Man ? is live entertainment, of every imaginable kind (this year's event begins Monday). Horn players form impromptu marching bands. Trained opera singers take the karaoke stage. Intoxicated revelers spontaneously burst into hoots and cheers. Big- and small-name DJs spin sets powered by portable generators, the vibrating thump traveling across miles of cloudless sky. Cacophony is the cheerfully tolerated norm, but there's one sound that's frequently met with eye-rolling derision: the ring of a cellphone. "It's one more thing that contaminates the purity of the event," says Kevin Rolly, a photographer from Los Angeles who has attended the festival every year since 1996. If phone access increases, Rolly says, "Burning Man slowly starts looking like the world that we're trying to get away from." Event founder Larry Harvey isn't as gently philosophical; he's been quoted lumping cellphone use at the event in with defecation and copulation ? something that should be done only in private. 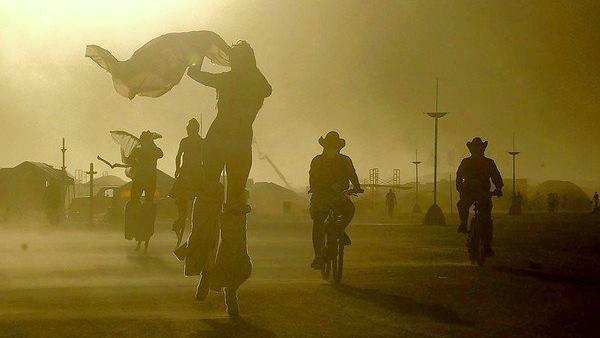 Of course, Burning Man's organizers are not about to go around making rules. The festival has famously been compared to a "physical manifestation of the Internet," because top-down structures are minimal to nonexistent, and most of its content is user-created. Held in the remote Black Rock Desert of northern Nevada since the early 1990s, the event ? whose sizable Silicon Valley participant base has included tech giants like Amazon honcho Jeff Bezos and Google founders Larry Page and Sergey Brin ? has been out of the reach of texts, tweets and cell calls for so much of its history that for many, the feeling of being "unplugged" has become an integral part of the Burning Man experience. In past years, the closest cellular towers, designed to serve the nearby towns of Empire (population 206) and Gerlach (population 217), would quickly get overwhelmed each August when Black Rock City (population 50,000 or so) rose from the featureless playa. Communication via police and event staff has always been available in the event of life-threatening emergencies, but for individual cellphones, things have been spotty at best. But change has slowly begun to creep in. As the event has grown, so has signal strength ? and the conflict between those who see phones as a matter of personal freedom ? one of the event's core values ? and those who see them as antithetical, especially to two of the "Ten Principles" that define the festival's philosophy: "participation" and "immediacy of experience." Another integral part of the event is an intrepid, DIY ethos, and in that spirit, David Burgess, co-creator of OpenBTS, an open-source cellular network software, in 2008 brought a homemade, "almost comical" setup he and a partner assembled in his living room to the desert, creating a working cellular network that routed a few hundred calls over a 48-hour period. Like most Burning Man projects, Burgess undertook this on a volunteer basis, as an opportunity to test and experiment with a new technology. In each subsequent year, Burgess has improved the system's reach and expects to have about three-quarters of this year's event covered. Burning Man proved an ideal test bed for development of Burgess' system, which he has since made available for use in other areas without cellular networks. "People who have a lot of experience in international aid say Burning Man is a very good simulation of a well-organized refugee camp," he says. "Because there's no infrastructure, it forces us to contend with a lot of problems that our rural customers have to contend with in very remote places. The power systems we installed in southern Zambia were informed a lot by our experience in Black Rock City." Burgess has engineered into his Burning Man network some limitations designed to make it "playa compatible" ? because he wants to facilitate communication between people who are already at or en route to the event, not to create a channel for real-world intrusions. Voice calls are limited to five minutes, and incoming calls can be received only from a number that the recipient has dialed within the past hour. "We do that because we know nobody, for the most part, wants to receive a random unsolicited call at Burning Man," he says. Yet even with these modifications, Burgess has received threats of sabotage, and indignant talk of installing signal-jamming equipment frequently erupts on Burning Man discussion boards. "People mostly don't understand what we do," he says. "Once they understand it, a lot of hostility goes away. I think a lot of people are closed-minded ? just in their own nonconformist ways." Burgess named his Burning Man camp "Papa Legba," after the figure in Haitian voodoo who serves as the mediator between the seen and unseen worlds. During Burning Man 2012, Stephanie Ellis' prayers to Papa Legba were answered when she found the camp after a frantic search. It wasn't an emergency ? the 23-year-old recruiter for a market research firm from Martinez was just homesick. Ellis has been to the festival in 2011 and 2012 and says that both times, she missed the immediate communication that cellphones provide. "On Day 1 or 2, I miss social media," she says. "I'll see something neat and want to take a photo and share it instantly and realize I have to take the photo with my digital camera and just wait to share it when I come back home." Ellis says she appreciated the vacation from constant connectedness that Burning Man provided but was also grateful to find a working phone at Papa Legba so she could call her mother and her boyfriend. Burning Man newbies have a completely different perspective from event veterans, Rolly says, because "they don't know the alternative. I think they're going to have a completely different experience, because they don't know what it's like to be without phones. But when you're out there, you want to be about what's going on out there." Rolly also feels that because most phones can upload pictures or video to the Internet instantly, "That has put more of a damper on people's freedom." The ability to stay in touch, however, is the only thing that makes the trip possible for some. "Let's be realistic," Burgess says. "Going to Burning Man isn't cheap. Most people who have the wherewithal to do that have real jobs somewhere. And if they disappear to the dark side of the moon for a week, they have to at least every couple days or so take a look at the emails, make sure nothing's on fire back home." But being off the grid really isn't in the cards these days. Commnet Wireless, the area's local network provider, anticipates that at the 2013 event, a lot more calls will get through. "We feel like we will do a very decent job this year," says Mark Hansen, Commnet's vice president of network development. The company has deployed extra bandwidth to the area's towers and performed major upgrades to its traffic-handling capabilities, Hansen says. All this despite the culture of resistance? "We saw that originally," Hansen says. "However, it's amazing ? the last two years, we haven't been able to keep up with capacity load. The organizers say they don't want it, but the people who attend use it." And this year, Hansen says, a signal will be more of a sure thing. "If they're outdoors, they should be able to use their phone, make their calls, check their email. "Our attitude with it is, the service is available to those who want to use it. If you want to partake in the true Burning Man experience, you should leave your phone at home."